I sometimes remember the ’80s. Well, either that or I’ve been fed so much information about the ’80s that I imagine I remember it. Whichever. Maybe it doesn’t even matter. Regardless, I think I remember the latter part of that decade, when the Pistons were routinely beating the Bulls with their “Jordan rules,” that they still claim weren’t real. Yeah. Right. Yet there was something electric about Michael Jordan that couldn’t be contained, not by the Pistons, and not by anyone else either. I was watching the NBA Channel today, and they were showing classic games from the late ’80s and early ’90s featuring none other than His Airness himself. He’s always been my favorite player, so I stopped to watch (I hardly ever watch the NBA Channel), and it reminded me of those commercials for Nike. At least I think it was for Nike. 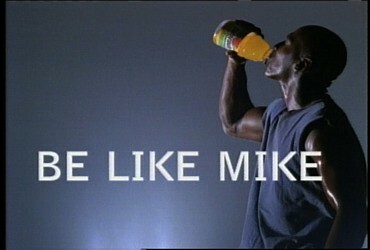 You know the ones, where they said everyone wanted to “be like Mike.” And I did. Totally. I wanted to glide in from the free throw line, tongue out, ready to slam the ball hard through the hoop. But I also wanted to be like Mike in other ways too. I wanted to be in those commercials, drinking that Gatorade, not because I loved Gatorade, but because I read somewhere that he made more from ads than he did even playing basketball. That intrigued me, knowing that someone who isn’t even an actor can make a ton of money… acting. I’m sure he didn’t absolutely adore Gatorade, but he was such an icon and role model to millions (including me) that he could sell pretty much anything. I would love to be able to sell just about anything, just by putting my name or image on it. To me being like Mike meant being financially secure. It meant getting to be in a video with Michael Jackson. It meant never worrying about anything (even though I’m sure he did worry about things. I just never saw it). It meant being in the limelight, even though the actual playing years were finite. It meant embracing the media because that’s where your paycheck really was cut. It meant being above so much. You know, because I’ve always felt I was below it all. Maybe being like Mike for once would be satisfying. At least for a while. Until the novelty wore off. Then I’d have to find something else to sustain me and my insatiable need to matter.